Nonfarm private employment increased by a seasonally adjusted 119,000 jobs for April, according to ADP's National Employment Report (link opens in PDF) released today. Human capital management company ADP partners with Moody's Analytics to produce this monthly report based on ADP payroll data representing 416,000 U.S. clients employing nearly 24 million workers in the U.S. 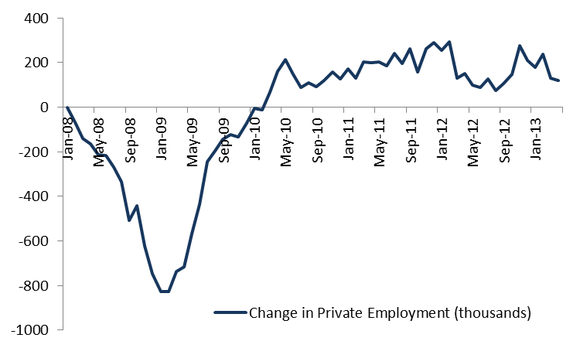 Source: Author, data from ADP. This month's report continues more than three years of positive employment trends, but April marks the second consecutive month of significant decreases in employment gains. Market analysts had expected only a slight 3,000-job dip from March's unrevised gain of 158,000. Using revised numbers, the February gain was 198,000 and the March gain was 131,000. January had clocked in with a 177,000 increase. According to ADP President and CEO Carlos Rodriguez, April's employment expansion rate is the slowest since September 2012. The services sector showed the most improvement by far, adding 113,000 jobs compared to the goods-producing sector's 6,000 additions. The trade/transportation/utilities industry category fared the best, contributing 29,000 more jobs in April, while manufacturing dipped 10,000 below last April's employment. "Job growth appears to be slowing in response to very significant fiscal headwinds," said Moody's Analytics Chief Economist Mark Zandi in a statement today. "Tax increases and government spending cuts are beginning to hit the job market. Job growth has slowed across all industries and most significantly among companies that employ between 20 and 499 workers." The article April Employment Picture Worse Than Analysts Expected originally appeared on Fool.com.